If you like the feel of an old school drum machine, then this is for you. The Akai Professional XR20 Beat Machine has over 700 sounds including drums, percussion, bass, synths, sound effects, vocal samples and more. You can create drum patterns and then use the effects engine for EQ, compression and reverb. If you are familiar with the MPC series that Akai has released, you will like the drum roll/note repeat feature that is included with this amazing production unit. The pads are firm and easy to play. 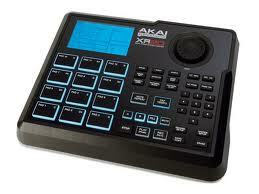 It is also very easy to navigate so you will be programming drums in no time. It sells for around $300 at Guitar Center. Click the link below for exclusive deals.